Translink, the local transit authority, offers a wristband that allows you to tap in and out of buses, the SkyTrain and other transit-y things. I decided to get one but because you can’t transfer funds between Compass cards (or bands) without visiting one of their two customer service locations, I had to wait till the start of the month (this one, April) to put my usual two-zone pass on the band. This worked as expected and I was set for my morning commute. I tapped in at Sapperton station. Success. Hooray for technology! I tapped out at Waterfront station. Success. Hooray again. I tapped in at the Canada Line Waterfront station. Success yet again. Smiles all around. No more fumbling to get a card out of my wallet. All I had to do now was deftly(ish) flick my wrist at the fare gate and I was set. But when I arrived at the Langara-49th Ave station, things changed. For the first time in my commute I had someone right behind me as I tapped out. This, of course, was when the wristband failed to work and I got the “LOL Try again!” message. But before I could try a second time, the guy behind me tapped his card. Why he did this, I don’t know. Morning brain? Inability to read? I mean, the message was obviously not for him, as he hadn’t tapped yet. I was thus unable to tap out. I took note of this, as I’d have to call customer support and have them fix the missed tap out. I wanted to confirm my suspicions online, but the Compass site was crushed by the first-day-of-the-month traffic and I was not able to get on. Then I left work early due to a weird fire/police situation (see other post for more). Sure enough when I got to the station and tapped, I got an “Insufficient fare” message. I used my Visa card to tap in and tap out downtown, which worked fine, but cost me money I shouldn’t have had to pay. I went to the customer service at Stadium station and the woman who helped was very nice and switched the stored value of the band back to the card, then, because it wouldn’t process immediately, she gave me a two-zone pass to get me home. Which it did. When I checked tonight, my Compass card is again showing the two-zone pass and the band is showing $0. It’s actually a little awkward to use the band. The area you need to tap is clearly meant for a card you’re holding in your hand. If you could embed the band in your palm it would work a lot better, plus be futuristic and also gross. If the tap area was on the side of the game as you walked through, it would work great with no surgical implants necessary. This happened on my very first trip. It seemed an omen. If it had happened a week in, I would have shrugged it off. I can see this happening again. Because the band is more fiddly to tap and because I travel during rush hour and often have people both ahead and behind me at the fare gates, it’s quite possible the same situation of “tap failed, next person taps before I can retry” could occur again. And again. I was wearing a jacket today, which probably contributed to Mr. Tap Happy’s confusion, as he never actually saw what I was tapping with. When people are rushing through fare gates, they are not really paying attention to much more than MUST TAP AND GET THROUGH. So I’m back to fishing the card out of my wallet, which is inconvenient, but generally reliable. Maybe I’ll move it to a pocket or something and just hope I never lose it. Or maybe I can find a time travel machine and go into the past and make sure the fare gates never get installed. Or maybe one day they’ll have the gates automatically detect payment without you having to do anything but walk through them. That would be nice. And probably impossible for another hundred years. But at least I tried. And I kept the band, just in case. But in among these improvements is another that doesn’t really work, and it’s not the fault of the designers. It’s more of a people problem. The first and last car on each train has one of the middle sections of seats removed and in its place a single bar that runs underneath the window. This is a designated bike area. Making trains bike-friendly is definitely a nice move, as more people are commuting by bike. Given that cyclists are still uncommon on the SkyTrain and that they have no better chance of boarding before anyone else, there is only a small chance they will actually get to use the designated space for their bikes. There’s also no way to keep other people out of the space (nor should there be). Conclusion: the dedicated bike area is a well-intentioned idea that ultimately doesn’t work. It’s really just a standing room section that would be better serviced by putting the seats back in. I hold out hope that Translink will ultimately switch from the dedicated space to a hook system and am doing my part by suggesting it to them, not just here, but directly via email as well. Until then, the bike space on the Mark III trains is likely to remain standees-only. This afternoon I quietly realized another thing I dislike about the Compass card system–the fare gates are biased toward right-handed people, as the spot to tap your card is on the right. I can’t really argue against the logic of the placement as something like 90% of the population is right-handed. Still, it’s another little thing that irks me about the system. But never mind that, I was tapping in at the Lougheed Town Centre station and proceeded up to the platform to wait for the next train. A shortish young man with a thick beard was conversing with three SkyTrain attendants. I didn’t catch everything said but enough to gather that a bag was laying on the track. I looked and sure enough, a green Save on Foods grocery bag lay resplendent upon the middle rail. One of the attendants noted that it would need to be removed ASAP. Immediately another young man came up asking if the system was going to be brought to a standstill for half a day because of this. I’m paraphrasing but from his tone, I’ve captured the essence of his question, even if he didn’t use those exact words. The attendant assured him there were be no delays. One of the other attendants radioed something to SkyTrain control. Probably something like, “Don’t let the next train run me over, thanks!” as he next clambered down onto the track, grabbed the bag, handed it to the third attendant, who then handed it to the shortish young man with the thick beard, as apparently the bag–which contained undisclosed items–belonged to him. I never heard his explanation for how the bag went from his hands to the track area. Only the security cameras will know for sure. He had a weird glint in his eye, though. The next train arrived a few minutes later, there were no delays, and the young man got on the same car as me, gently holding the bag at his feet. He said nothing and did nothing before I got off two stops later. But that glint in his eyes never went away as he stared out the window. As I was coming out of the Waterfront SkyTrain station today I noticed a man off to my left standing near one of the fare gates and who seemed rather agitated. Apparently he was having problems getting the chosen gate to recognize his shiny new Compass card. He finally got through and angrily strode forward, holding the card out before him and shaking it angrily. “This card is taking too long to work!” he snarled to no one in particular. He then spotted a transit attendant standing nearby and marched to him, where he continued to rail against his slothful card. This is the first instance of what I call Compass card rage I’ve witnessed, though I suspect it will not be the last. “Out of service” tape plastered over gates. Now imagine multiple gates going down in a station that only has a few and everyone at rush hour being funneled through one or two working gates. Happy times. Also, whoever approved the astonishingly annoying tone that plays when you tap your card should be forced to listen to that sound all day every day until driven mad. This would likely take less than 24 hours. You might say I’m not especially impressed with the Compass card system. In fact, I’ll say it: I am not especially impressed with the Compass card system. If they could fix it to work flawlessly with my smart watch in, say, two months, I might be willing to upgrade my assessment from “not especially impressed” to “will grudgingly tolerate.” Translink has promised smart device support sometime. I’m going to speculate it will roll out in the year 3000. It’s Black Eye Week for SkyTrain! On Wednesday there was a problem with a switch at Waterfront Station that forced them to use only one platform during the early morning rush hour. I ended up being twenty minutes late for work (only five in reality as I normally get in fifteen minutes early). The worst part about this was the constant announcements with Mr. Stammer from SkyTrain control. Tip: Write down what you want to say, then read it into the PA. Don’t think off the top of your head every fricking time you turn the PA on. As outages go, this was pretty minor compared to the previous two. On Thursday the PA system hummed to life as soon as I sat down in a car on the Canada Line at Waterfront Station. Never a good sign. Mr. Stammer said there was a minor power issue in Richmond and delays would be minor, only a few minutes at most. My train, whose ultimate destination was YVR-Airport, headed off. A few minutes later, when the issue should theoretically be resolved, Mr. Stammer came back on and was all, “Hoo boy, nope, this is a major power problem. Richmond is hooped! We’re setting up a bus bridge between Marine Drive and the airport. Sorry. We’ll figure this system out one of these days, lol!” My train’s destination suddenly changed to Marine Drive. That’s the stop after mine so apart from delays amounting to a mere five minutes, I wasn’t particularly affected by this. The overall delay for those who were affected amounted to around thirty minutes. Again, relatively minor compared to the Mega-Outages but still, you start to wonder how much duct tape is involved in holding everything together here. Four days after I missed a run due to a massive breakdown in the SkyTrain system…there was another massive breakdown in the SkyTrain system. Fortunately Jeff was listening to the news on the radio (remember those?) and heard the whole thing had gone on the fritz yet again and he swung over from his work site to pick me up. As a result of getting a ride home in the truck I was actually 15 minutes earlier than usual instead of four hours later. Nice! Human error led to yesterday’s Millennium and Expo Line disruptions. An experienced electrician was installing a new circuit breaker for the Evergreen Line at a power distribution panel when he accidently tripped the main breaker feeding the critical systems at SkyTrain’s operations centre, causing a system-wide shut down of train controls. TransLink spokeswoman Jiana Ling said passengers involved in last Thursday’s shutdown were trapped for an hour and a half, but it appears those involved in Monday’s incident were more impatient, with many forcing the doors open after just half an hour. One of the doors was pulled off with a crowbar, Kelsey said, which prolonged the delay by two hours because trains won’t operate if a door won’t close. 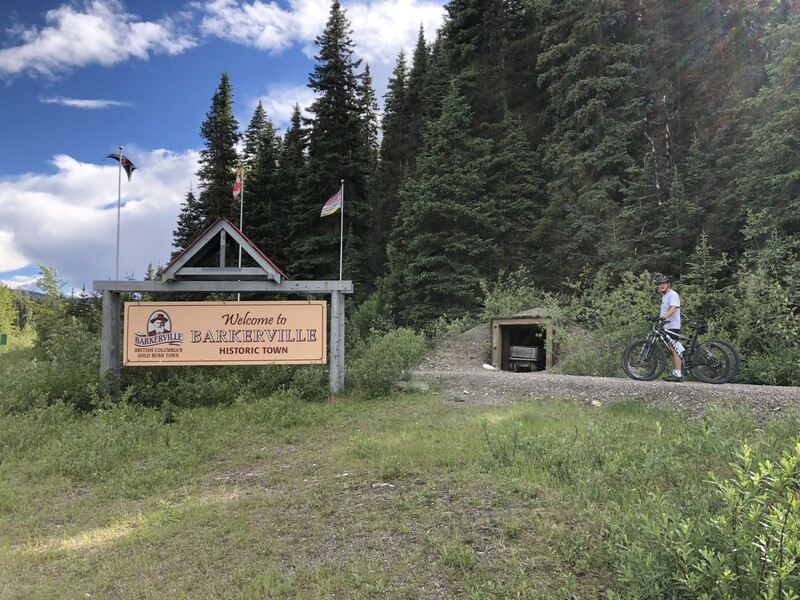 Tannis Steele, 18, who was stranded Monday on an air-conditioned train near Main Street-Science World Station, said her fellow passengers broke out after half an hour because they were bored. I’m not sure what to make of passengers on the SkyTrain carrying crowbars with them. But I’m not the slightest bit surprised it only took half an hour for someone to pry the doors open and get out and the rest following, yes, like sheep. And delay the system starting up even longer. Good job, people. Good job, indeed. 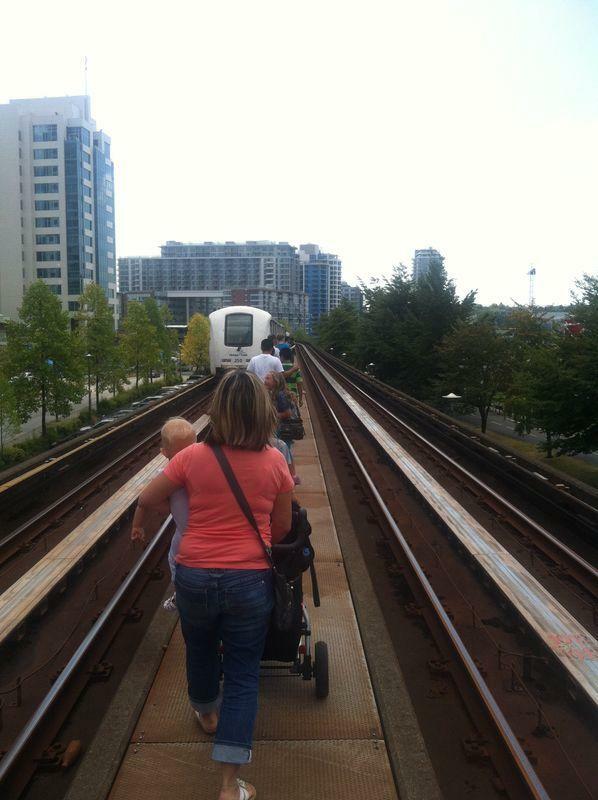 Mom and the kids out for a walk on the light rail line. I’m curious why she thought it was better to carry the kid under her arm than put him/her in the stroller. And the mind positively boggles over what she would have done on the Millennium Line where there is a fence going down the middle of the guideway area, preventing things like strollers from even fitting. All in all, another terrific day for public transit in the Lower Mainland. On Thursday I began my commute home at 4 p.m. as usual with the plan to do my run before dinner, meaning I’d be heading out around 5:30 p.m. or so. I get home around 5:10 or so and need about twenty minutes to recover from the stupor that results from an hour of riding public transit. Everything proceeded normally on the Canada Line, so-named because its route from downtown Vancouver to Richmond is just like crossing Canada if you turned the route east-west and added 4,000 km to it. All proceeded normally on the Expo Line until my train began approaching the Royal Oak station. Sometimes during peak hours trains will stop outside stations because there are so many of them running and they need to give them a minimum safe distance between each other. This usually happens at the busier stop like Waterfront or Commercial-Broadway but it can theoretically happen anywhere so I didn’t take much notice of it. Shortly after the train stopped the P.A. crackled to life. This immediately triggered my “Uh oh, what broke on the SkyTrain?” alarm. As it turned out, it was a major computer failure affecting a great swath of the system: all of the Expo line east of Metrotown (Royal Oak being the first station east of Metrotown) right up to an including Braid station on the Millennium Line (Braid is one station past where I get off at Sapperton), as well as the Expo Line spur into Surrey. The fact that the first announcement used the word “major” was bad. At this point I would normally be about 12 minutes from my final stop of Sapperton. It was a few minutes before 5 p.m.
Like ships not passing in the night because ships need to be moving in order to pass. Not too long after the initial announcement another came on advising people that this was a “long term” issue and to stay on the trains. Do people actually get out of the trains between stations when the system goes down? As it turns out, yes, they do. Because people are impatient and dumb. More announcements followed, reiterating what had happened and emphasizing that we would be stuck for a long time and to not get out of the train because then they have to cut power to the whole system to avoid electrocuting idiots and that will only delay things further. No one left my car, fortunately, but some reacted less favorably to the delay than others, as you will see. Shortly after this announcement I noticed someone using the emergency phone at the other end of the car I was on. Most people on the train were quiet–possibly conserving energy to prepare for the upcoming battle over supplies–so I could hear what he was saying and what he was saying was that a woman was starting to hyperventilate. I looked but couldn’t tell who he was referring to and entertained the idea that he was fibbing to get our train bumped to the top of the “please get us to a station before Survivor starts at 8 o’ clock” list. It worked! A minute or so later an announcement for our train only informed us that we would be taken back to Metrotown station where emergency services would be arriving. By this time I could see the woman in question and she did not look so good. The train them hummed to life and rolled back into Metrotown station. Incredibly people tried to get on the train, even though it was going nowhere. This was half an hour into the shutdown and anyone still in a station knew what was happening. As I got off the car I saw the woman was now face-down on the floor. I hope she was okay. I think she was probably okay. She may be riding the bus for awhile after this. Metrotown has one of the largest bus loops in the system and it was already a sea of people. I finally found the end of the line for the New Westminster bus, the closest that would get me sort of home. It took over 40 minutes for the line to move to where I was close enough to actually be guaranteed a spot on the next bus. Some people apparently or conveniently could not find the end of the line and formed a blob of people beside the bus, effectively cutting in. This became apparent and after the bus pulled up it sat for minutes without letting anyone board. You could sense tension in the air, along with a lot of body odor. Some in line noted the others not in line and called out to them. One woman started calling out “Shame on you! Shame!” I felt like I was in a European film. A transit officer arrived and tried as diplomatically as possible to tell the blob of people that they were totally cheating and we’re onto you. Some moved back, some stood their ground. A man in the blob called out, “You can’t even see where the line is! How are we supposed to find where it is?” Several others in the blob murmured agreement. I wondered how the hundreds of people already in the line managed what these people had not but chose not to express this thought out loud. We were finally allowed to board. It was now 6:47 p.m. I managed to get a seat at the back. The bus driver noted construction on Kingsway (more delays? Sure, why not?) and asked people to be nice to each other and to the bus driver. He said someone pulled a knife on the previous trip. Because pulling a knife works wonders for reducing an already tense situation. The passengers on my bus were either knifeless or not inclined to flash their blades. The worst thing I had to deal with was the sturdy man sitting next to me constantly falling asleep and slumping onto me. Did I mention he was sturdy? He was, especially when he slumped into me, which was often. By the time the bus rolled into New Westminster station it was after 7:30 p.m. I would need to walk up the street to Columbia station and catch a bus there that would kind of sort of go through my neighborhood. I was tired and hungry and called my partner and made puppy dog eyes over the phone. I told him it would be way faster for him to pick me up than me taking another bus and we could eat sooner and aren’t you hungry? He agreed. Shortly after leaving he called back to report an accident blocking the main route. 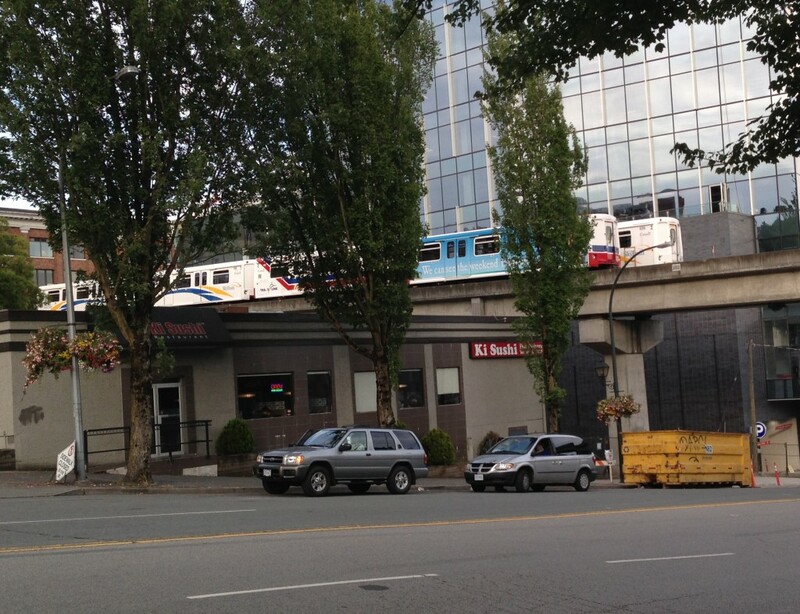 I wouldn’t be surprised if the SkyTrain was somehow responsible. He took an alternate route, I walked a few blocks down and finally got in the door a few minutes past eight. My commute took four hours, roughly four hours longer than normal. The CBC website has a brief, lazy write-up of the story here, the centerpiece of which is a bland complaint from Twitter. While the story is no great shakes, the comments are predictably even worse. At least in this modern age we can all ignore the strangers we’re forced to hang out with thanks to technology. A massive failure of the transit system may be inconvenient but it’s no reason to stop checking Facebook on your smartphone instead of talking to the person squashed into the seat beside you on the bus. I confess, I played Threes on my iPhone for most of the bus ride. I’m part of the problem. After finally having dinner it was, of course, far too late to do a run, the second time in less than a week that a highly unusual event has caused a run to be postponed. And hopefully the last for awhile. Despite all this, the SkyTrain is still way nicer than riding the bus. When it actually works.